Andrea P. Thau, O.D. recently assumed the position of vice president of the American Optometric Association (AOA) She is the owner Dr. Andrea P. Thau and Associates in Manhattan. Ian Farrell was named vice president for Institutional Advancement at The College of Saint Rose. A native of Troy, N.Y., Ian was previously assistant vice president of Development at Virginia Tech, leading fundraising and alumni relations. Marc Gronich recently launched a new website, JBizTechValley.com, a production of Statewide News Service, Inc. The website serves as an online directory and includes more than 50 congregations in the greater Capital District, 900 Jewish business owners and professionals, Jewish education opportunities, Jewish-run non-profits, a television program called “The Jewish View” and a news component, News Jews Can Use. Josh Bloom, partner at Barg Coffin Lewis & Trapp, LLP, was added to the advisory board of the Bar Association of San Francisco (BASF) Environmental Law Section. He has been a member of the executive committee for the Environmental Law Section since 2010. Bernard A. Krooks was recently selected as a 2015 New York Super Lawyer by Super Lawyers® magazine and was included in the Best Lawyers in America® guide to legal excellence in the U.S. Bernard was also elected to the Estate Planning Hall of Fame by the National Association of Estate Planners & Councils (NAEPC) and was one of seven professionals honored with the designation of Accredited Estate Planner® (Distinguished). He was named President of the Board of Directors of The Arc of Westchester, the largest agency in Westchester County serving people with intellectual and developmental disabilities and their families. Bernard is a founding partner of Littman Krooks LLP. William Joseph Newman was recently recognized by Northwestern Mutual as a new member of its 2014 Forum Group. William is affiliated with Tronco Financial Group based in Latham, NY. Richard A. Joslin, partner of Collins Einhorn Farrell PC, Southfield, Mich., was selected to the board of advisors for Crittenden Research, Inc. He will be providing insight on the outlook of insurance and how it impacts professionals. David Van Buren recently retired as associate vice chancellor for Academic Affairs and dean of the School of Graduate Studies at the University of Wisconsin-Platteville. Prior to joining the faculty in 1976, he served on the staff of the Criminal Justice Coordinating Council in the mayor’s office in New York City and worked as the coordinator of public housing security for the City of Albany. Abby Donnelly, founder of the Leadership and Legacy Group, High Point, N.C., was featured in the inaugural Leadership Greensboro Alumni Newsletter. Arthur Vidro directed the premiere of Calamity Town, a play Joseph Goodrich adapted from the Ellery Queen novel of the same name. The production was staged at the Claremont Opera House, Claremont, N.H.
Jennifer Manner was recently named co-chair of the Advisory Board for Rockefeller College. Howard Miller of Bond Schoeneck & King, Albany, N.Y., has been included as one of The Best Lawyers in America in the field of education law. He was named a 2014 New York Super Lawyer in the areas of employment & labor law and schools & education law. 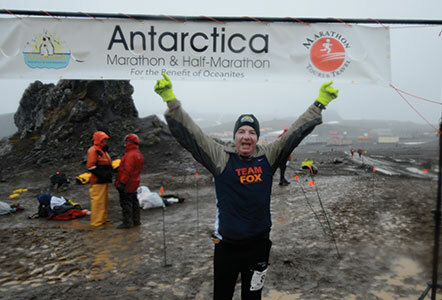 David Weber recently completed the Antarctica Marathon and became one of the first few hundred people to complete a full marathon on all seven continents. David has participated in marathons on the Great Wall of China, in the Australian Outback, and through a Big 5 Game Safari in Africa. Peter Sands is now the director of the Honors College at University of Wisconsin-Milwaukee, where he is also an associate professor of English. Eric Stravitz launched Stravitz Law Firm in Lanham, Md., and was recently named a 2014 D.C. Super Lawyer. Daniel Baker, partner with Sahn Ward Coschignano & Baker, PLLC, in Uniondale, N.Y., has been appointed Tenth Judicial District Representative to the Real Property Law Section (RPLS) of the New York State Bar Association (NYSBA).